In this profound study, Richard Seddon brings together essential but often overlooked quotations from the work of the philosopher and scientist Rudolf Steiner. Steiner made no claim to divine inspiration, but described how - through the vigorous discipline of inner development - the capacity for spiritual-scientific research could be acquired. Rudolf Steiner, who founded anthroposophy, undertook research into many of the incidents recorded in John's Gospel, and reported his results in lectures given across Europe. 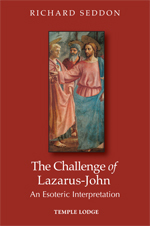 In compiling Steiner's various statements, The Challenge of Lazarus-John reveals that John's Gospel not only gives a historical account, but also represents a path of personal development or initiation. After the prelude characterizing Creation, the Gospel describes how the Christ being descended into the physical and spiritual constitution of Jesus of Nazareth at the Baptism. Crossing the threshold between physical and spiritual worlds, the Gospel writer places emphasis on the development of the higher self in freedom, on the rebirth of the soul, and on the raising of Lazarus. An interlude considers the significance of the seven events referred to as "signs", and the seven "I am" statements in relation to higher stages of cognition. The remainder of the Gospel is seen as an expression of the seven stages of Rosicrucian-Christian initiation and their reformulation in the process of human evolution described in anthroposophy. This culminates in an examination of the spiritual processes that take place in the constitution of Jesus during the Crucifixion and Resurrection. It is Lazarus-John's personal witness of these events that enables him to write his unique Gospel. Drawing together such insights and interpretations, Seddon has produced a comprehensive monograph that supplements existing biblical commentaries and illumines John's enigmatic Gospel as a truly Christian path of modern initiation - a challenge to all human beings that will remain for millennia to come. RICHARD SEDDON studied moral sciences (philosophy, ethics, logic and psychology) with Bertrand Russell and John Wisdom - an advocate and colleague of Ludwig Wittgenstein - at Cambridge. He spent his working life as a personnel manager. A student of anthroposophy for seven decades, he is the author of several books including Mani, His Life and Work, The Future of Humanity, Philosophy as an Approach to the Spirit, Europa and The Mystery of Arthur at Tintagel.